One of the big questions today in country music concerns what kind "tag" to place on a song or style of song. 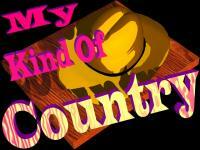 Country Rock, Alternative country, traditional, pop.. the list goes on and on. Well, this crazy bunch of cowboys decided to stir the pot a bit more by creating their own unique style called, "Hip Hop Country". What the heck is Hip Hop Country?? Well, listen to the title track from their first released CD in 1999, "Welcome to Hip Hop Country".. it won't totally explain it, but it will give you and idea of what this wild bunch is all about. 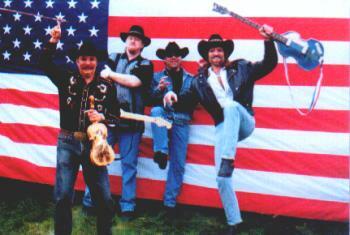 George Lee and the Crazed Cowboys now have two albums to their credit. The first, as listed above is "Welcome to Hip Hop Country", which contains 14 original songs all penned by Tom Lee (guitar, backup vocals and Tambo) and Chris Webb (guitar, organ and "Miscellaneous Obscure Percussion")... startin' to get the idea behind the "Crazed" part now, aren't ya! The second release came in 2001 and is entitled, "Damn! It's Good to be a Cowboy!" which features, a whoppin' 23 songs. Of these songs; 9 are written by Tom Lee, 4 by Tom Lee and Chris Webb, 3 by Tom Lee, Stuart Heck (drums, and lead vocals on tracks 11 & 20) and Paul Zahn (lead & rhythm guitars, harmony vocals, shaker and organ), 1 song by Steve Kaspar and 6 pre-recorded songs used with permission such as one of my old favorite pop songs, "Brown Eyed Girl". Tallied up, this gave me 37 songs to review and only pick only SIX of them for showcasing! Not an easy task. I went through each song with my scratch pad next to me, selecting some, then scratching those out to replace with others. It was a long battle between the two CDs and myself to come up with the ones I liked best to represent the Crazed Cowboys on MKOC. The selections to chose from are plentiful, indeed and the variety of styles is abundant. 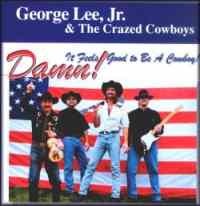 You can go from Rockin' Country to a great 2-step, western swing (which also makes for a great cha-cha) to some beautiful ballads... and let us not forget, Hip Hop Country, born and bred by George Lee and the Crazed Cowboys themselves. As for the production of the CDs, which were produced by Tom Lee, the sound quality is great with smooth harmonies from the artists which rise above the musical backing of the instruments that are there to enhance the songs, not override the vocals. You don't need a lyric sheet to sing along.. the words of the songs are sung intelligibly so there's no wondering, "what's it saying it that part?".. as I've done myself with some songs. I don't know about you, but I hate to guess or wonder what the singer/singers are saying.. I want to be able to understand each word without straining to recognize the English language... even redneck language. All in all, both albums are very well done. The arrangements, instrumentals, mixing and the vocals all blend together to bring you some great entertainment.. not to mention just having some plain ol' fashion fun! Crazed?... that very well may be ... Talented?... Absolutely! Country Fryed News by Linda Fryer! Visit Crazed Cowboys' Website for more craziness!